Peter Brueghel (or Bruegel), the Flemish painter (1525-69), shows us an excellent example of a three-handled, Rhenish stoneware pass cup being put to good use. 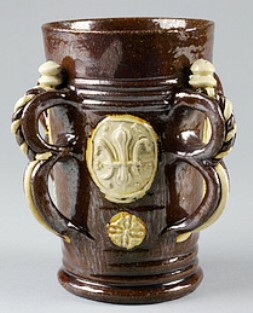 A 1500’s Cologne “pass cup” (stoneware mug.) “Rare” if not restored. 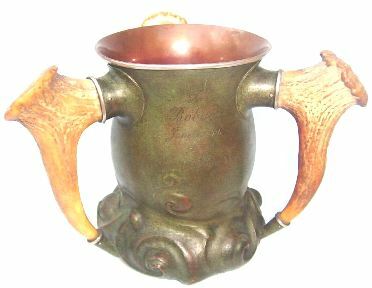 A Russian copper three handled ‘pass cup” in “as found” condition. 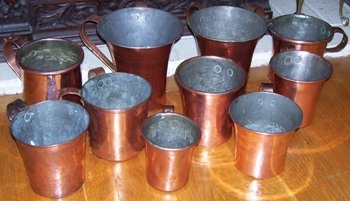 See [a] more copper Russian vessels at the end of this page. 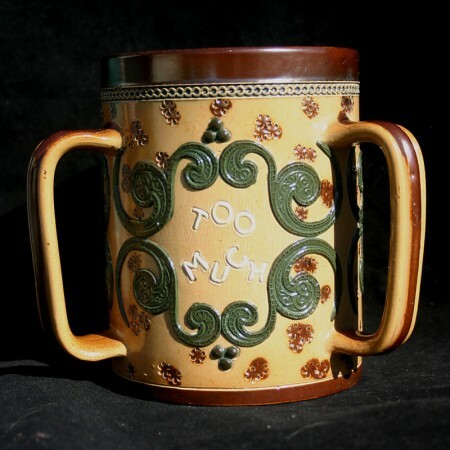 It was immediately after I purchased my first 2-handled pass cup [an English pewter two quart tankard, with two 1/2 lids attached to the two large handles; long since sold (another dumb move) that I became really interested in the custom of communal drinking and the vessels associated with such an antiquated activity. Coincidentally, the same month I bought that pewter tankard, Master Steinologist John Ey’s article, “Stand beside me, Winston!” (Prosit No. 74, December 1983, Page 1124), featuring a two-handled English pass cup, appeared. Shortly after that, I decided to put together a small display collection of these communal drinking vessels, most now long outdated and misunderstood. Yes they are misunderstood (and I will explain the use of that term later) and even scorned by the hygienists and sanitizers of this, the germ-free 21th century. 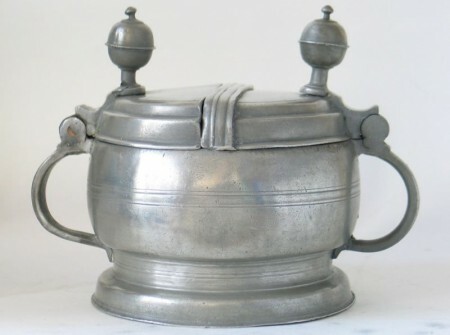 I paid less than $100 for that first 1800’s pewter pass cup of mine: cheap, but it had long ago been abused and needed a small amount of restoration work. Most of the “more modern” pass cups that are illustrated in this article can be found in the $200 to $600 range. Perhaps you are by now asking, what is a “pass cup?” Is this a new term? Well yes, actually it is! They have been called other names throughout history by various peoples and cultures. Names such as “loving cups,” “tyges,” “standing cups,” “trophies,” “goblets,” and “quaiches” are just a few that have been used. The design and intent of a “pass cup” is to create a vessel that one can drink from and then be able to pass it along to yet another person, so he / she may drink from it also. These cups usually will have two or three handles. Those with four are scarce, yet I have seen them with as many as six, such as an English SOCIAL society’s vessel made of pewter. 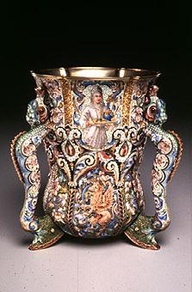 As with our “beer steins”, pass cups are made of almost every material: brass, copper, clear and colored glass, pewter, stoneware, creamware, all wood, wood with silver or brass, ivory, and many done in silver. Those in silver are of course now worth more than their precious metal weight. In 1989, a Gorham sterling silver, three-handled pass cup with “Martele” stamp sold at Martin Goldberg’s auction for $7,975 (ref. a), which is a lot more expensive than even of the largest V & B Mettlachs. 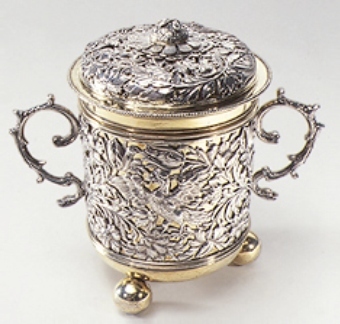 A sterling silver English pass cup (called a “loving cup”) dated 1680 – Metropolitan Museum of Art, New York. “In this case of cup passing, not only are the handles used to steady the vessel, they are used by twirling them around the fingers to summon the servants. The passing was done by moving the vessel back and forth from the servant to the lounging toga-clad drinkers (b).” If there was any communal drinking going on, the authors don’t say. 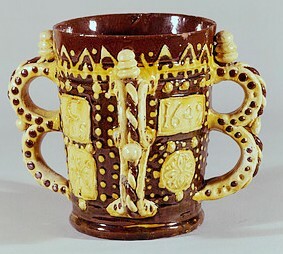 One of the earliest pass cups seen, which came from the European continent, is a two-handled pottery goblet, approximately 6” tall, described as “perhaps a wedding goblet, with the face of a woman on one side and of a man on other, 15th century!”(c) Where the ears would be on these faces are two small pottery handles, obvious to the keen observer for holding the goblet while full and then passing it to and from a new bride. This means that as far back as the 1400’s, the common folk were using ‘pass cups’ to celebrate their special occasions. 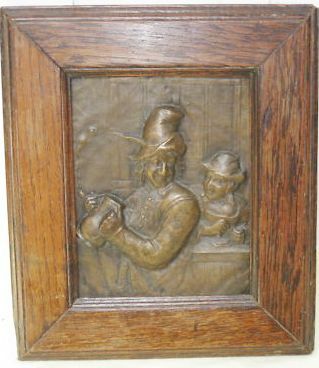 A Dutch / Brabant area tavern drinking scene, in relief on copper or bronze. Ca. late 1700’s. 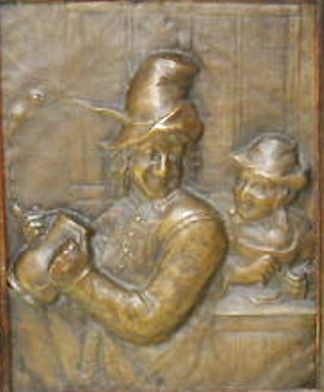 It shows a gentleman holding a 3 handled “pass cup (mug)” while a young girl watches. Copied from an unknown [to me] painting. A Spanish mouth blown “Cantir.” This piece can be passed by its large circular handle and the fill spout [L] , the wider of the two spouts. Quaich: The body with willow binding, a central silver disc, the lug with silver mounts, engraved with Dutch style tulips, the whole restored with later feet. Circa late 1600’s. Scotland is yet another country where we find early references to yet another type of different vessel called the “quaich” (pronounced “kw_ak.”) In his article published in The Magazine Antiques, Richard McClenahan says, “There were no handles, or lugs, on a mazer bowl, whereas there are usually two or rarely, three or four, lugs on a quaich. 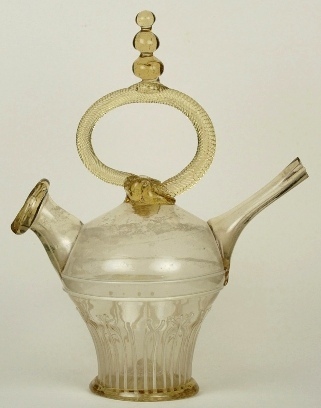 Quaiches probably came down from the Highlands during the early 16th century and continued to be used as individual drinking cups or in larger sizes as ceremonial drinking vessels until they were replaced over a century ago by glass and ceramic cups. 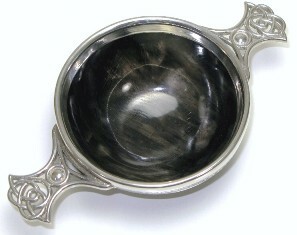 A newer pewter mounted oxen horn quaich. A very nicely done piece. 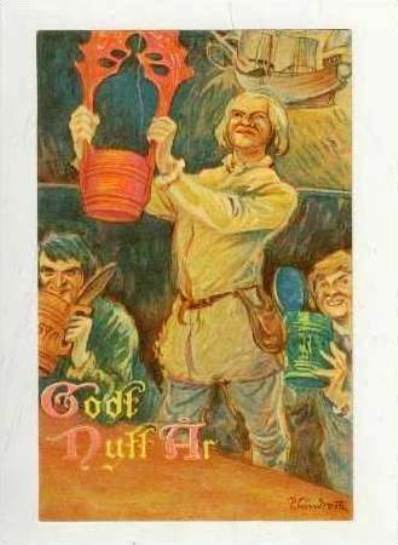 Of course, we have other examples of communal drinking in the literature that describes the Scandinavians and their peg tankards (“I’ll take you down a peg or two…”) and the development of “caudle” and “posset cups,” used for centuries both in England and the new world. Some of these had more than one handle and could be included in this article. Space is somewhat limited (by the Word Press program’s number of photo restrictions) and further pursuit of those avenues would not leave us with some of the more important or interesting aspects of “pass cupping.” So, in a brief review, we can tell that in the time period from the 1400’s through the 1600’s, various forms of “pass cups” emerged from the far north of Europe to its far south, and even to the remote areas of the British Isles. It is even possible that William the Conqueror took one with him to celebrate his victory in 1066! 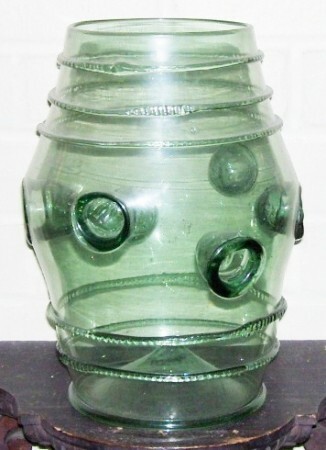 A large (12 inch [x] 6 inch) German Waldglas, “Daumenglas” [FWTD] (German: “thumb glass”) These are easily “passed” using the holes endented in the body’s sides to place one’s thumbs and fingers. 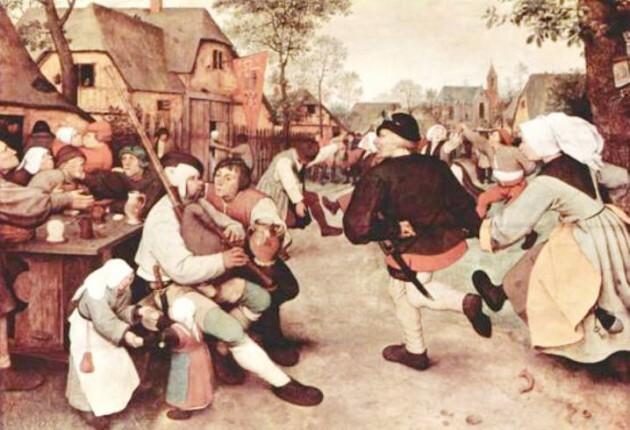 These were very popular in Germany and the Netherlands in the 16th and 17th centuries. and came in all sizes. The Corning Muaseum of Glass has quite a nice collection. Some may still be found for sale today, but at a premium! This one is a mid 1800’s replica, and a very good one at that. “GUILD CUP” – Boot makers guild, dated 1713. 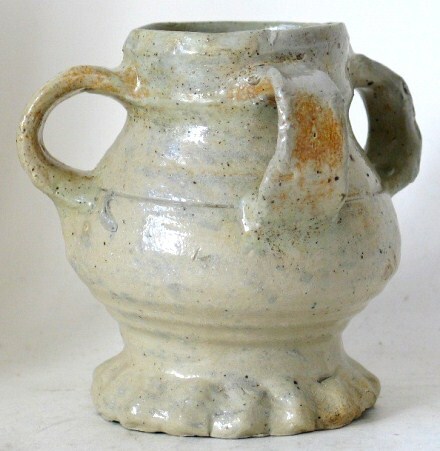 I feel I must also say a little about the old English tyg, (also tyge) which several centuries later than the 1500’s became known as “the loving cup.” Vessels for holding liquids were made of this lead-glazed ware in various parts of England. The ‘tyg,’ or drinking cup with two or more handles, was made with more or less ornamentation in relief certainly as early as the sixteenth century. 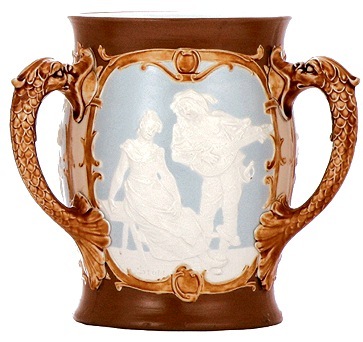 This cup, reallyn a mug, was often large enough to satisfy the moderate desires of two, three or four persons seated around it, each one of whom could lift it by his own handle and drink from his own side of the rim. English lead glazed three handled Tyg, dated 1621. By the late 1700’s into the 1800’s, a verbal transition was occurring where the popular English usage of these multi-handled drinking vessels, previously called “tyges,” were now being called “loving cups.” The words, “loving cups” are used to describe pass cups on many occasions and, as I said earlier, there is much misunderstanding, misuse, or mis-description that is found with this term when used today. 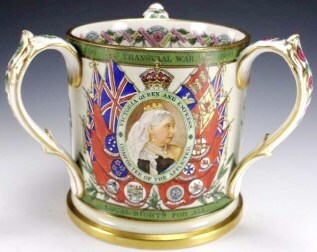 This is because hardly anyone today knows what a “loving cup” is, or was, or why? “In the good old days ‘lang syne,’ kings were regarded as the cleverest and the best of men. They created the most useful inventions and established many of the most beautiful customs. Therefore, it is not surprising that tradition should positively assert that the idea of a loving cup first originated in a royal brain. The time and nationality of the kingly inventory is not recorded with certainty – he may have been Henry V of England or Henry IV of Navarre. It is tolerably certain, however, that it was one or the other of those famous kings who developed the idea as the result of a curious experience. As the story goes, he was out hunting one day, when he became separated from his companions, and rode alone in the forest until he was very thirsty. Suddenly he came upon a wayside inn and demanded a cup of wine, and in obedience to his imperial call, an awkward little serving maid came forward holding the cup by the handle in such a manner that when it was passed to the king, a portion of the wine was spilled on his majesty’s gloves. 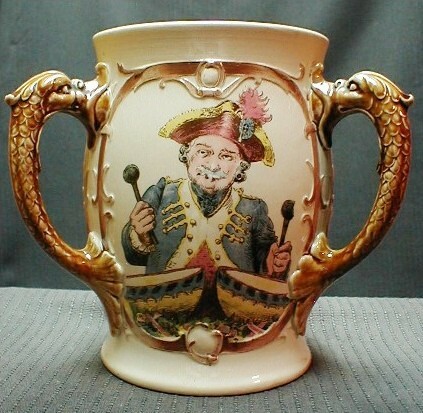 King Henry rode away refreshed, but his soiled gloves set him thinking, with the result that he arrived at the conclusion that a cup with two handles would prevent a recurrence of the mishap, and as soon as possible he ordered such a cup made at one of the royal potteries and had it sent to the inn. When next he stopped at the little hostelry and called for wine, he was served by the same little maid, who in passing the wine to his majesty, grasped both handles of the cup in fear and trembling, lest she break it. The astonished king lost another pair of gloves, but found a way out of his perplexity by having a third handle added to the next cup which he sent to the inn. “Surely,” he said, “out of three handles, I should be able to lay hold of one.” Such is the traditional story of the origin of the loving cup as we know it; but certain it is that long before King Henry’s day, cups and mugs with more than one handle had been used as the drinking vessels in social bouts of good fellowship.”(h) But a great story, yes? As time went on, the English embellished their plain pottery tygs by adding such things as applied “cookie cutter” molded relief scenes around the body of the hunt and men smoking, etc, and sometimes turning the handles into a trio of greyhounds. Some come with slver rim mounts . These additions were certainly very popular in the time frame of 1850-1900. The idea of using a horn, however, never really went away. 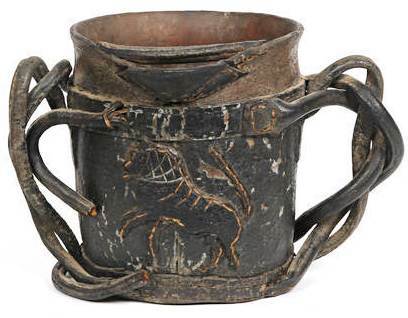 Besides the manufacturers of drinking horns in the centuries to follow, lots of cup makers used natural horn to embellish what would have been a plain metal pass cup. 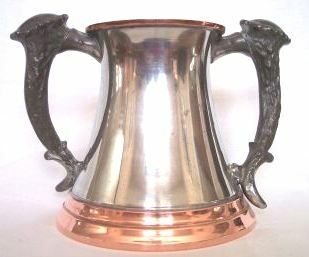 An unusual three handled “Pass cup”, with really tarnished silver with a copper inside lining. Sold for $2550.00 — 11-07-05 on eBay. The early Lennox C.A.C. brochure also states “another pretty story of the loving cup is told by Miss Strickland, who says that Margaret Atheling, wife of Malcolm Kenmore, in order to induce the Scotch to remain at table for final grace, devised the “grace cup”, which was filled with the choicest wine, and of which each guest was allowed to drink ad libitum after grace had been said.”(h) I like this explanation and think I may shortly institute it in my household when certain persons come to visit. A note of interest to the new collector of pass cups is due here that also explains some of the misunderstanding out there in the wonderful world of antiques. As several of these loving cups, both by C.A.C. and other firms, are large in size, and as knowledge of these customs has long died away, one may now find these vessels being advertised and sold as “VASES”, which I think is a sad, terrible fate for a drinking vessel! A notable example recently appeared in a large east coast antique weekly, and I quote, “This signed ‘Rookwood vase’,having three handles sold for $110.00 at an auction conducted by…” Even Dave Rago in his column for the newspaper The Antique Trader, failed to pick up on the fact that “the vase handed down in the family” was in reality a loving or pass cup. such as the ivory and sterling . An excellent example of the fanciful progression of the loving cup into a sports trophy is shown above. On first brush this appears this might be a pass cup. It is not. It is a Circa 1700’s pewter butter container, used on the table. to keep the butter cool. Pewter (to me) maintains its heat / coldness better than most any other metal. It is in the remnants of this late Victorian habit of communal drinking where the collectors of today will find the majority of pass cups for their drinking vessel collections. I don’t believe I have seen a “true” American pass cup dated past 1925. It appears that the idea of passing around liquids in American drinking societies, both formal and otherwise, “died” quite soon after the great “Spanish flu” epidemic of 1918-19, which killed 50 million deaths world wide! A medieval tyge from England? No, this is a replica of the style made at “Castle Hedington” in England. Circa 1870. The English seem to be the biggest country to have carried on this tradition, up until the present day. However, the idea of communal drinking is still practiced by the members of American and European sports clubs. As recently as last year, (when this was first written) the participants in Potomac, Maryland’s Polo Club drank from their victor’s prize, a silver champagne bucket, as they passed it around. Machined wooden pass cup with “faux” deer antler handles. Circa 1890. 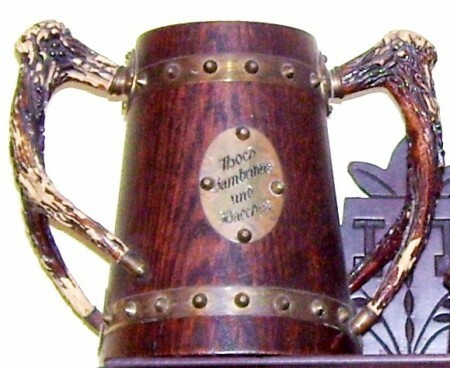 With the wording on the brass cartouche, “Hoch Gambrinus und Bacchus.” This vessel can be used for both beer and wine. While most examples shown in this article are English made, this shows that the Germans also engaged in a lot of “pass cupping” also. 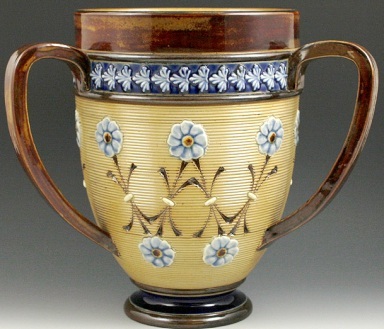 Prior to the beginning of the 1900’s, two potteries we are vastly familiar with, Royal Doulton (Lambeth) in England and Villeroy & Boch (Mettlach) in Germany, were mass-producing stoneware pass cups. The Mettlach Book, by Kirsner, lists five (numbers 2167, 2168, 2236, 2237, and 993  ) and illustrates two “pass cups” by V&B, Mettlach. Above: Doulton Lambeth Loving Cup, by Alice Cooke, “Motto Ware”. 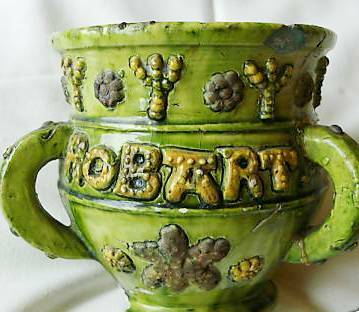 The bottom is fully marked Doulton Lambeth England, this mark was used after 1891, and the pattern number of 5175 narrows the date to between 1894 – 1896. The motto on three sides says “More Than Enough is Too Much”. These cups were made by Doulton in etched and mosaic ware, as well as in applied relief. Auction results of about three years ago show that some of these tygs sell around the $300 to $500 range. (k) The V & B, Mettlach “pass cups” appear not to be doing as well, perhaps because of collectors’ lack of knowledge of them, their use or their history, which is one of the reasons I decided to write this article. Or, it simply could be that more people collect Royal Doulton wares. Now some of these Doulton three handles pieces are and were made to be used as “vases.’ This is a good example. The flowers on the outside gives one every indication of such as does the body design. 11 / 2011; Seen on eBay with this description: “A stitched leather spouted twin handled vessel or loving cup / blackjack.” (Steve’s note: This is not a “blackjack,” see the Compendium at this web site for the proper definition. 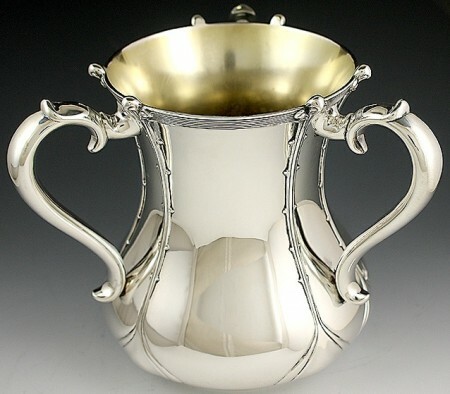 The above is slightly newer in scope, but almost as worn: This leather and sterling silver “Pass cup” was presented to James Coats Auchincloss (Yale class of 1908) by the freshman baseball team (class of 1910). It is inscribed “Presented to J. C. Auchincloss by the 1910 Freshman Baseball Team in appreciation for his services as manager.”The tankard measures 7 3/4” high, 6 2/8” across the base, and is marked sterling on the lower rim. 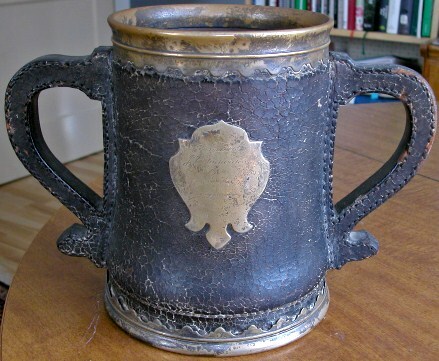 J. C. Auchincloss, Jackie Kennedy relative and Congressman from New Jersey, was manager of the freshman baseball team when he was an upperclassman at Yale and was given this tankard in appreciation. A toast being given with very large communal Scandinavian wooden pass cup. 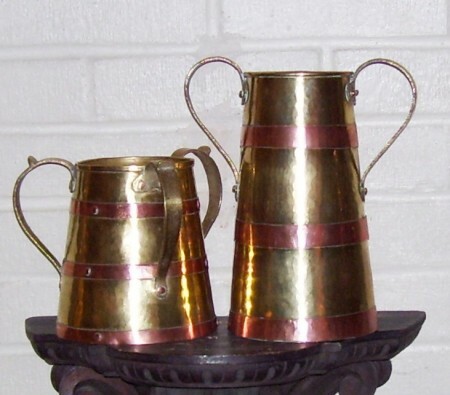 Two Russian, pre-revolutionary brass with copper rings “pass cups.” The Russians liked this variation of metals and one also can find many of these done in the reverse. 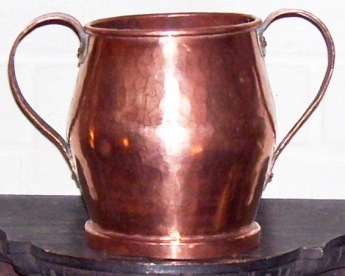 A lot of these copper and brass Russian vessels now on the market are being hailed as Jewish “hand- washing cups” – simply because they have two or more handles. Not 100% true! The custom of drinking and serving beer from multi-handled copper vessels is well established all over Russian and a couple of its neighboring countries. 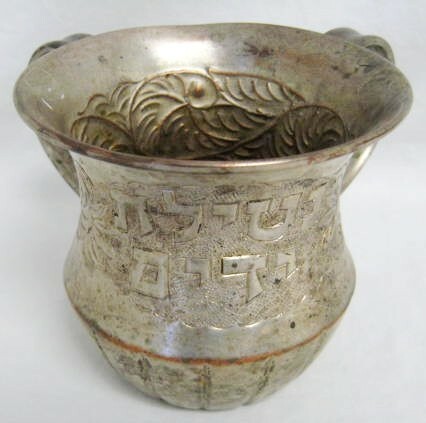 A lot (but not all) Jewish hand washing cups cups are marked as such, either in relief, such as the two shown below, or by engraving both professional and folk art style . 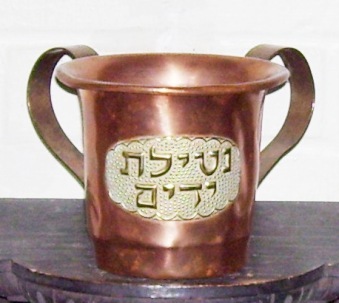 A Mid Eastern made tinned copper Jewish hand washing vessel. 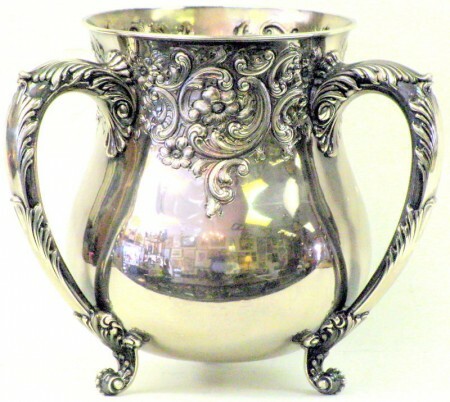 The big names in American Silver made large “Pass Cups” into the early 20th century! They were quite the rage. “Black, Starr and Frost” – Sterling silver; the handles become the legs ! 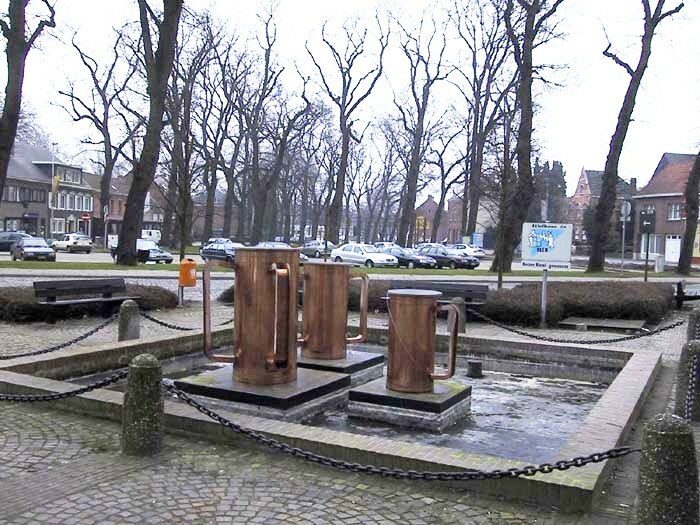 1, 2, & 3 Handled mugs at the fountain in the city of Oolen Belgium. (a) The Antique Trader, page 89, July 5, 1989. (b) Modern Pottery, pp 79, 85, 89, date unknown. (c) Vanished Crafts, Artia, Prague, pp 133-134, date unknown. (d) Rhenish Stoneware from the Mary Rose, by Colin D. Townsend, Prosit, No. 76, p 1180, June 1984. (e) The Encyclopedia of Glass, Phoebe Phillips, Crown Books, NY, 1981, page 75. (f) Antiques, pp 402-405, September 1969. (g) Pottery and Porcelain, William C. Prime, 1878, pp 312-314. (h) Brochure, The Ceramic Art Co., Makers and Decorators of Exclusive Productions in Artistic China and Porcelains, Trenton, NJ, not dated, pp 24-25. (i) Collecting American 19th Century Silver, Katherine McClinton, Bonanza Books, NY, 1968. (j) The Mettlach Book, 2nd Edition, by Gary Kirsner, Glentiques, Ltd., Coral Springs, Florida, 1987, p. 287. (k) Sotheby’s International Price Guide, Volume 3, 1987-88 ed., The Vendome Press, New York.